A century on from the Battle of Romani, we look at several objects related to the Sinai Campaign to see how it differed from New Zealanders' experiences at Gallipoli and the Western Front. 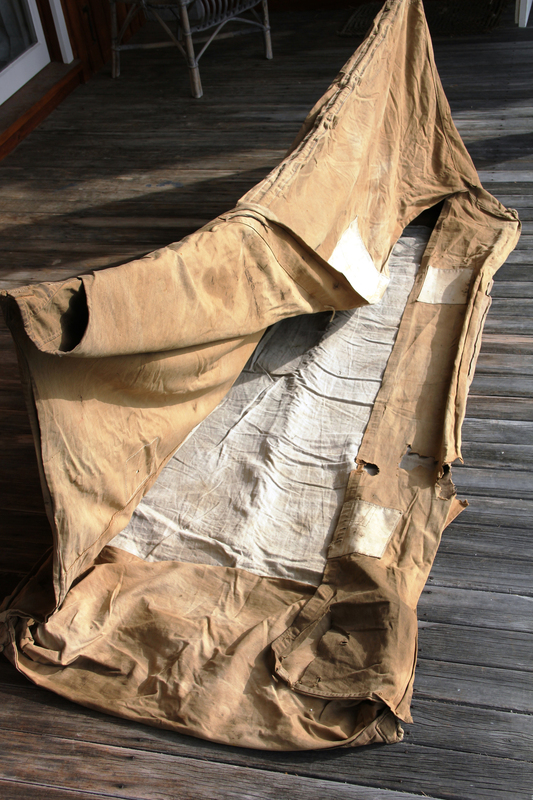 What objects were needed to survive a desert war? On 9 August 1916 Gordon Harper, of the Canterbury Mounted Rifles was fatally injured in the last stages of the battle of Romani fought in the sands of the Egyptian desert. Following his death a number of objects associated with him were sent back to his family in Canterbury. The objects tell us something about how different was warfare in the desert from either the steep hillsides of Gallipoli or the muddy trenches of the Western Front. The first object is Gordon’s bivvy tent which is proudly inscribed in bright yellow paint with the words: ‘Lieut. G.G. Harper MG sec CMR’. This tells us that he was in the machine gun section of The Canterbury Mounted Rifles (CMR). Why did Gordon need a tent? On Gallipoli he had lived in a trench, as would the diggers in France. But the war in the desert was a highly mobile front. The mounted rifles travelled on their beloved horses from one engagement to the next. There were no fixed front lines with trenches. But you needed some protection. Although it was searing heat during the day – up to 54°C – it was bitterly cold at night. There could be heavy rainstorms and howling Khamsin winds. So some protection was needed. 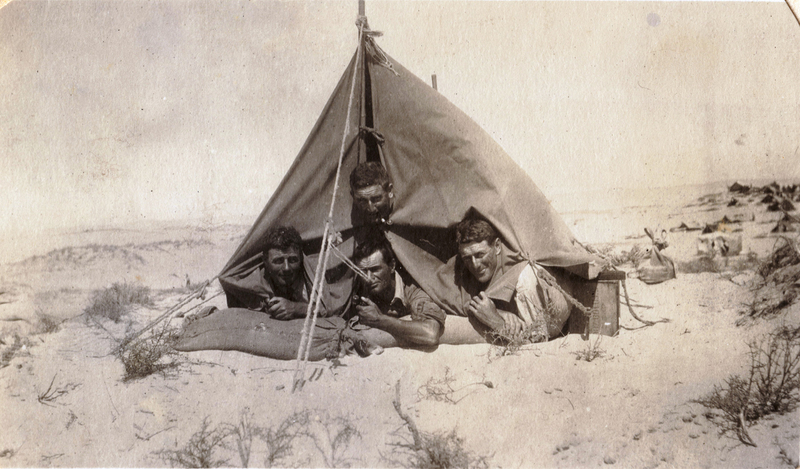 Some of Gordon Harper’s mates enjoying his tent. Gordon Harper’s bivvy tent today. 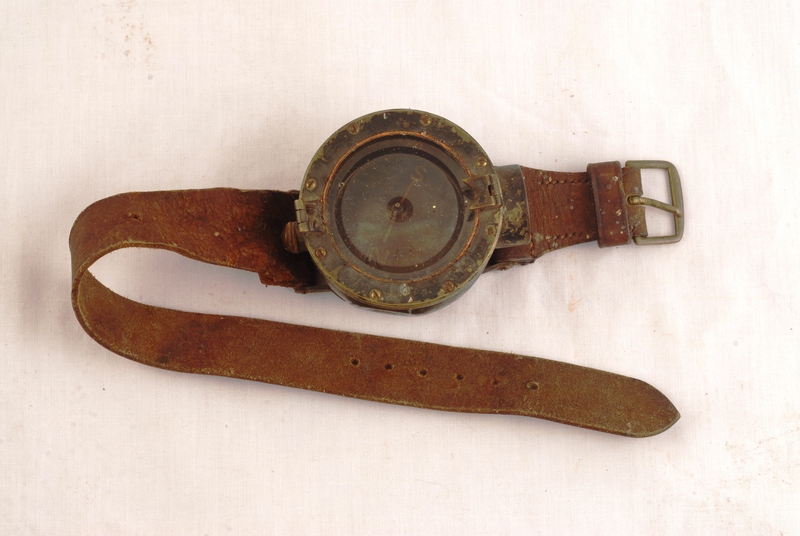 The second object in the collection is a wrist compass. Whether it was Gordon’s or perhaps his brother Robin’s is not clear. It is not important, for both were officers in the CMR, and both would have had the responsibility for guiding their men riding their horses across the featureless plains and hillocks of the desert. Gordon writes, ‘It is like being at sea out in the vast desert and it is not easy to see very far owing to the wavy formation of the sand.’[iii] The men were constantly on the move seeking out evidence of Ottoman forces. They were constantly on the lookout for brackish water for themselves and their horses. To know their position was vital. They did not of course have the benefit of a modern GPS system, but they did have compasses and detailed maps on a scale of 1:40,000. There are several such maps, beautifully coloured in bright orange in the collection. A wrist compass in the Harper collection. 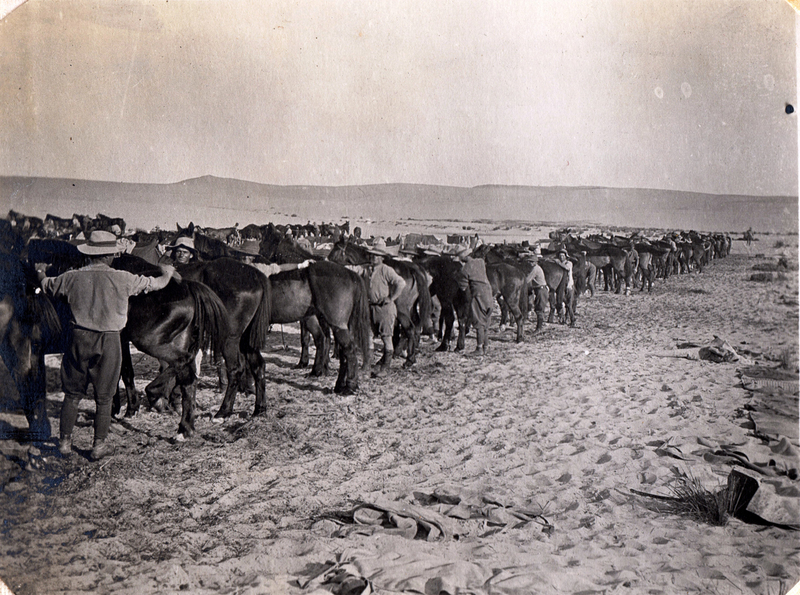 Grooming the horses of the New Zealand Mounted Rifles before heading out across the desert. In the end Gordon decided that it was not the Ottomans, but ‘it is the desert which is our chief enemy. There is nothing so inscrutable as its changeless face; there is so little indication of the hidden enemy; and there is no warning of the scorching blast which rises from its red hot sands, and envelopes the unfortunate troops who are struggling in its grip.’[iv] No wonder that a compass which might lead the men and horses to water was so important. 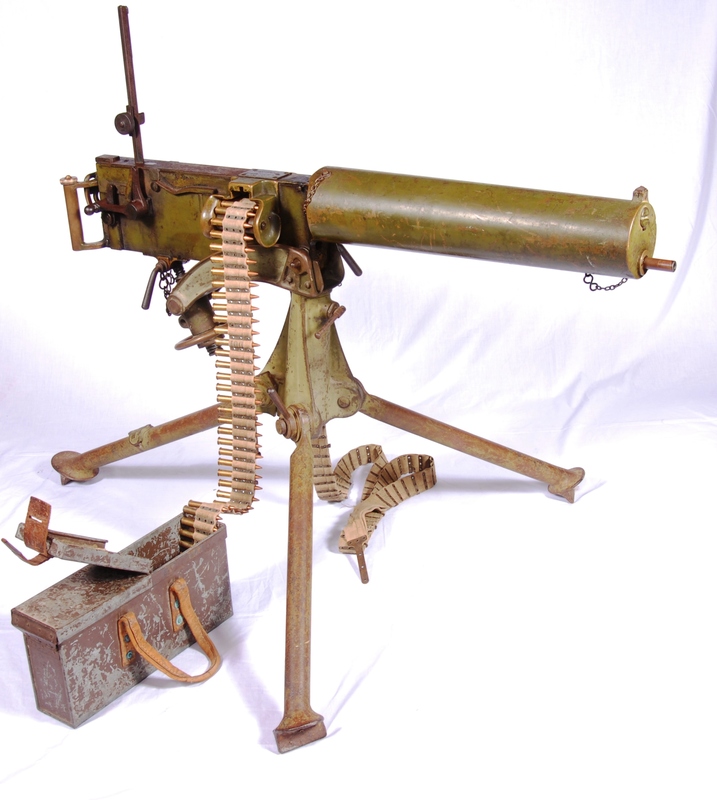 The third object is the Maxim machine gun no. 10628 which Gordon was firing on that hot afternoon of 9 August 1916 when he died. The gun had been originally used for practice by a territorial force, the Canterbury Yeomanry, of which Gordon was a member. The gun was then brought with the CMR to Egypt and to Gallipoli where it was used extensively under Gordon’s command during the attack on Chunuk Bair in early August 1915. Almost exactly a year later, the Ottoman forces were attempting to capture the water-bearing settlement of Romani, about 35 kilometres east of the Suez canal. The Ottoman attack began on 4 August, and on four occasions in six days, the CMR were involved in the fighting. Maxim machine gun no. 10628, the very one fired by Gordon Harper at the Battle of Romani in August 1916. Finally on 9 August, they were part of a force which attempted to defeat the Ottomans at Bir el Abd, just in front of Romani. All day they attacked in temperatures of 38°C. Eventually in late afternoon it was decided to withdraw. Gordon’s machine gun section kept up a fierce protective fire to allow the men to retreat. He himself refused to withdraw, and the official history made the comment: ‘The bold decision of 2nd Lieut. Harper to hold his dangerous position in order to cover the Canterbury regiment’s withdrawal, with the slight chance of successfully fighting his guns to safety, was an outstanding example of self-sacrifice.’[v] Eventually, and perhaps inevitably, Gordon was hit; and although his brother Robin rode a mile on horseback to recover him and bring him back to safety, Gordon eventually died of his wounds three days later. As for the gun, this was its last action. The Maxims were replaced after the battle of Romani and gun 10628 was sent back to Gordon’s family. It is now on display in pride of place at Te Papa’s exhibition, Gallipoli, the Scale of our War. 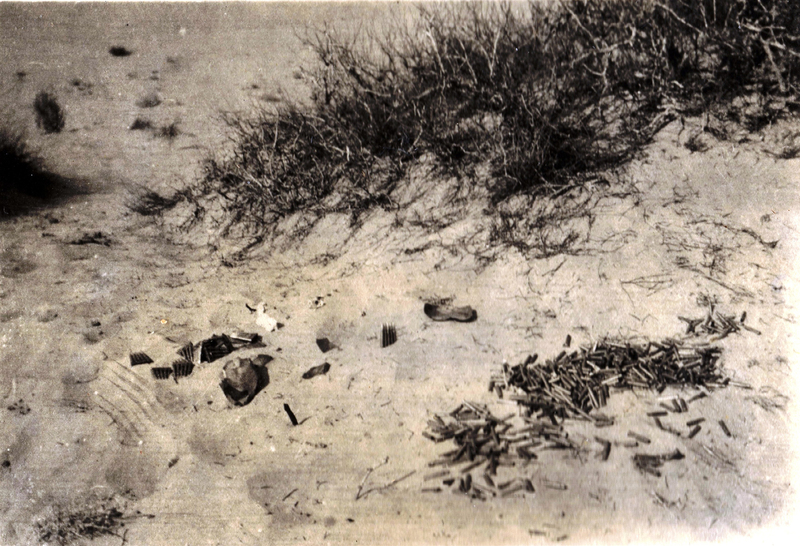 A pile of bullets left in the sand near Bir El Abd where Gordon Harper worked his machine gun in the afternoon of 9 August 1916 during the finals stages of the battle of Romani.